IF anyone at AFL House is giggling at the fall of a so-called competitor, Australian soccer, then AFL Commission chairman Mike Fitzpatrick should take the smirk off their faces. Clive Palmer, the deposed holder of the Gold Coast A-League licence, is a ghost of Australian football's past ... and a warning for the AFL's future. The AFL has had its Palmer moments, albeit with different unfoldings to private ownership in Sydney and Brisbane not to mention the capitalist disaster at West Coast. And it may just face them again if the gulf between the "haves" and "have nots" forces Port Adelaide, North Melbourne, the Western Bulldogs and Melbourne to find "sugar daddy" backers. It is always fascinating to think what would be unfolding at Alberton today had the late Allan Scott – rather the AFL, SANFL and the Power members – been paying the bills. Rich men rarely hand over their money to sporting clubs and walk away waiting for a season ticket, a warm greeting at matches and a Christmas card. They have opinions – and, as Allan Scott did, they usually express them, forcing football clubs to panic. They also like how their money buys power. Look at North Adelaide in the SANFL today. Its sugar daddy, Rob Gerard, did not get his man, Glenn Elliott, on the board – and he has withdrawn his cash. Now there is an alarm bell on how the membership of a football club could be undermined by the wallet of an individual. Thankfully, Mr Toyota Motor Corporation of Japan at Gerard's other club, Adelaide, does not get caught up in who sits on the Crows board. Port Adelaide is far more vulnerable to the whims of a rich individual. It currently has Gordon Pickard. He will not embarrass the Power in public. But Pickard is very demanding on how his money is used at Alberton. And he expects a return for his cash. The members are not so lucky on dictating how their money is spent. Melbourne has had its moment. When Joe Gutnick became the Demons' sugar daddy, claiming the club presidency after the failed merger with Hawthorn in 1996, he brought his business philosophy to Melbourne. Some may say this would have been quite appropriate. But in business, "Diamond Joe" was about eliminating the competition to make his business bigger. In football, it is about a league – and a game. Kill off the opposition each weekend on the scoreboard. But off the field there has to be a co-operative spirit designed to make the league and game stronger. Heavens know who Melbourne was going to play in the AFL if Gutnick had killed off the rest of the league. At least Collingwood president Eddie McGuire in his determination to make the Magpies the biggest sporting club in Australia has not denied his on-field AFL rivals the chance to dip into his overflowing trough. The AFL has spared itself from a Clive Palmer shakedown. There is no Kerry Packer moment to unfold in the AFL, despite the wishes of some football fans for the Crows and Eagles to breakaway to form a Super League putting the Victorians in a minority system. The AFL owns the licences, the clubs' names, their logos and jumpers ... and, most importantly, it holds the contracts with the players. It also is running a competition that, despite the billions offered from Australia's richest domestic broadcasting deal, has half of the 18 clubs unable to fund themselves. How long the AFL can bankroll these clubs before a tycoon seeks a new toy is the very reason why no-one at AFL House should look at Clive Palmer as a joke but as a warning of "there but for the grace of God go we." Four Corners last year revealed how vulnerable the A-League was to the whims and wallets of tycoons. There did not appear to be a sustaintable business model based on club members for the A-League. The AFL may be nearing this point. As Jeff Kennett left the Hawthorn presidency last year he warned: "As we go into next season, there's no doubt in my mind that at least half the clubs will fundamentally be in administration. "By that I mean, they will be dependent on the AFL for continuing financial support, above the dividend that is paid to each club, in order to keep them financial. "It is an issue that has to be addressed. It cannot be ignored. You cannot have a healthy competition if more than half the clubs are fundamentally under administration. "It brings up the question of the sustainability of the code. We can cover over the cracks if we wish, but there is something more deep-seated occurring at the moment that does require our attention." The AFL is bankrolling at least four AFL clubs. It may gain a fifth in June with Port Adelaide. Most revealing in Sydney chairman Richard Colless' speech at the Swans' annual meeting last month. Guess how many Swans members have voting rights at their club? Sydney's sugar daddy is the AFL. Colless said: "I am advised that Mr Tim Laing is here as the appointed proxy of the AFL, which is classified as the transitional member (basically the only voting member), and therefore we have a quorum." At what point does the strain on the AFL's finances – which took a $23 million hit last year to set up the Greater Western Sydney franchise – become so great that the AFL Commission has no choice but to endorse a sugar daddy tycoon at Alberton, Arden Street, the grand halls of Melbourne and at Footscray? Or maybe Clive Palmer at the Gold Coast Suns? 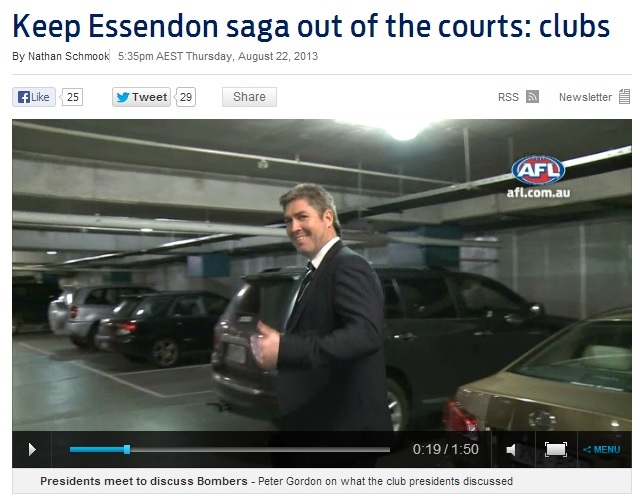 That should stop some giggling at AFL House. The AFL is living on borrowed time as it is unable to expand beyond Australia's shores. The Lack of international competition and sponsorship recruitment will start to weaken their talent base as the rugby codes finally begin to take advantage of their ability to attract international competition and sponsors. If they wake up and expand their codes nationally they have the potential to topple the AFL from it's perch. Most importantly, if they can be sensible and develop and share their facilities with football. as they all play on the same shape pitch, they can share resources and save money. This would give them year round stadium usage and income with few clashes in fixtures and no competition for players. Is that why the League is in turmoil with owners pulling their millions and creating a rebel administration? And the failed franchises in NQ & GC? The AFL is just doing fine. This has to happen but unfortunately RL continually shoots itself in the foot when things are going well. It is a testament to the game though that it keeps getting back up and is as popular as ever with sponsors and Fans. You fail to mention that AFL is a much more aesthetic game than NRL thus will continue to draw supporters away from NRL in Australia where as NRL will continue to not draw supporters away from the AFL. The internaional scope is very much over-stated. Wow, in Rugby League, you can play NZ, South Africa and England... such a diverse international competition. Also, the article failed to mentioned the biggest sugar daddy of them all. The late and great Mr. Richard Pratt! Whats so aesthetic about a scrum? Or how they start the game by kicking the ball up into the air and running into each other like blind retards? The part where the players run through/break the lines of opposition defence is quite aesthetic though. AFL players do that as well, only better. and it's so aesthetic to watch a bloke catch a ball, stop the game, pull his socks down, take his gloves off, take his gum shield out, test the wind (INDOORS), pull his socks up, have a drink, kick the ball and miss and still get a point. Give me a game of skill and tactics any day over the stop start bore fest of aussie rules. How many scrums do you get in a game of NRL? Not many and even then they are very quick because of the ability to feed the scrum in league. A scrum is over in league before the aussie rules bloke has even had time tested the wind. In union the scrum is one of the most aesthetic parts of the game as it allow the quicker guys a free reign to run the ball. I still dont know why they cant even organise a proper home and away season where all the teams play each other twice. They use to complain because there would be too many matches, couldnt fit them in ? So what do they do, add extra teams ?? The way the game is played will change, and clubs will have to restructure their pre season, surely it cant be too hard ? Could you please provide proof of this ever happening on a regulation set shot? Your gripes with set shot goals could be said about Football and set pieces/Stoke's long throws, or when in Rugby they go to convert a try, they need to bring on a little bit of plastic and/or some sand to set that kick up, don't they? There are two differences here between AFL & Rugby. AFL gets a point for missing, and Rugby don't have the hold the ball (meaning the kick should be more accurate, by taking away the risk of ball drop). Think of penalty kicks in football... "Oh, you missed. Here, have another 4 shots"
But that's a penalty for an infringement in rugby, generally kicking is done with ball in hand with someone running towards you. Also to score points the ball (direct from the kick) has to touch the ground before being kicked, so an even greater skill of not only dropping but the bounce from the ground as well. Since when do you get another 4 goes to take a penalty in football? Are you talking about AFL now? no I was talking about rugby. From what I have seen of afl kicking is normally done with everyone standing around waving and if they are really keen jumping. In a union game you see the big men in the air every line out.....If this is what makes it aesthetic for you watch a couple of Super Rugby games, you will be hooked. Not to mention the slight of hand, step or swirve the ball players put on to beat a line of defense. in saying all that though if one mark a round gets you buzzing, you better stay away from the real exciting football sports. I gave my son a piggy back the other day, neither of us found it aesthetically pleasing. Their bodies are built for Basketball not Football, that's why you are not allowed to tackle properly in ALF. I played it once and gave a free kick away every time I tackled someone. How was I supposed to know you can't actually tackle them properly? Is the picture above from Rugby League? Tackling properly... how so? By tripping them? Wow they kick the ball half a dozen times in a game! Why is it a football code again?! I was talking about both, obviously with the lineouts Union, the other aestheticly pleasing points are NRL. So they only kick the ball 6 times in a game....So only 6 completed sets in a game of League, no conversions or penalties, no chip and chase, no 40/20's......Only 6 times ....Wow. Ok, so maybe they kick the ball a dozen times in a game, maybe even 20 times. Compare that to how many times they throw they the ball? It should be a handball code, not a football code. Goes for Union as well.